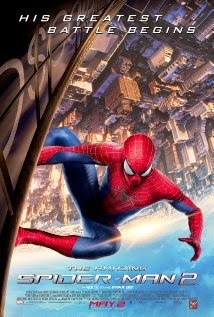 starring: Andrew Garfield, Jamie Foxx, Emma Stone, Sally Field, and more. Well... I had heard this movie was getting mixed reviews and after watching the movie, I have my own mixed feelings about it. Gwen Stacy wore a cute green tweed, knit hat. It wasn't as cute as the beige, cabled and bobbled knit hat from The Amazing Spider-Man, though. And, that's my review... heh heh. I kid. There's more to say about this movie. This movie had a bit too much packed into the story. I think the part with the Rhino could have been completely cut out. The Rhino was very over-the-top and cartoonish. He stood out compared to the other villains who were moody and eccentric. The Rhino was silly. I really did not care for the heavily armored look of his costume, either. That was to connect him to Oscorp, but I wished they had used another villain for that instead. Peter Parker has girlfriend problems. Just as he does in the comics. The main girlfriend problem in this movie is that Peter can't keep his word to Gwen's father. He's supposed to stay away from Gwen in order to protect her, so he means to break up with her but before he can do that, Gwen breaks up with him in order to protect her own feelings. Perhaps if she had let him be the one to officially cut ties, that would have given him the closure he needed so that he wouldn't stalk her and still consider her his sort-of girlfriend. Though really, she broke up with him! How can he still consider himself in a complicated relationship with her?! And so a lot of what happens to her in the rest of the movie can be blamed on him for trying to keep that connection to her as exactly what he originally wanted to prevent from happening does happen. He can't take all the blame as she is a very independent young woman who does what she wants. Harry Osborn was really, really freaky looking. I'm talking about when he transforms into the Green Goblin. More like the Green Golem. He looked so wretched and pitiful. I wondered as I watched the movie if he would have been better off with the goblin mask on but I think because he didn't gain any muscles or strength when he transformed it made the character so weak, desperate, and not terrifying, just as Norman Osborn looked weak when he died earlier in the movie. I think Jamie Foxx as Electro did a great job in the movie, though. He portrayed the right amount of nerd and psycho. I, also, liked Spider-Man. Not Peter Parker so much but when he's in costume and he's cracking jokes at the bad guys. And I liked the changing of the seasons near the end of the movie. The whole movie was still fun to watch. I was just hoping for a bit more. Something that was more unified in theme and tone. And I must mention the X-Men clip that came after the movie was confusing. I wondered why they were showing it and if that meant a cross-over would be happening soon, but the movie people were probably just trying to hype up the new X-Men movie on it's own. So, watch The Amazing Spider-Man 2 to see the Green Golem and his obsession with the preeecioussssss Spider-Man blood. It's his, preeeeecioussssssss. I'd give this movie 3 out of 5 stars.